*Thanks to Jus Accardo and her publicist Cathy! Dang Books-a-million, always sending me coupons. I can't help myself when there are savings involved! *Also, some cool magnetic bookmarks of classic book covers! And then, thanks to the awesome Crystal @ My Reading Room, I got one of the books on the top of my wish list and some cool swag! Great set! Love If I Stay. I prefer the original hardcover, but you're right that it doesn't match Where She Went. So much awesomeness! Half-Blood is excellent and Anna Dressed in Blood is AMAZING -- you'll have so much fun reading it...and some heebie jeebies as well, lol. Wow great haul! I read Anna a few weeks ago and it's awesome. Hope you like it! Been hearing such great things about Anna Dressed in Blood. Will buy it eventually. Half-Blood was excellent. Enjoy your books. Oh gosh! You have Half-blood! I just got Daimon ebook this week to start off on this series and I can't wait to get a copy of Half-blood! 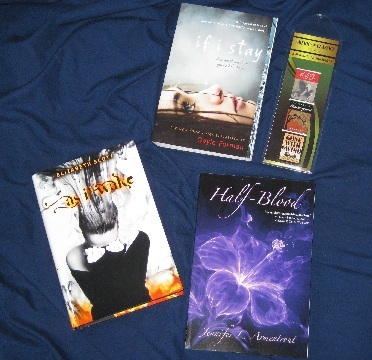 I have Anna Dressed in Blood on my TBR list and I can't wait for that either. P.S. - My IMM will be up until tomorrow. wow half blood shipped really early! and you won anna dressed in blood! Lucky! I want to read that book so bad! Half-Blood has an amazing cover! Enjoy all your new reads, most are new to me. Happy reading! Great haul! Anna Dressed in Blood is awesome!! And I'm looking forward to Half Blood. Hope you like them! I wanna read Anna Dressed in Blood so bad! and you'll Looove If I Stay! great swag and thanks for stopping by my blog :D! I hope you enjoy all of your books. Especially Anna Dressed in Blood. I can't wait to read that!! 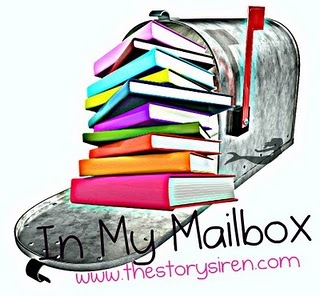 =) Come check out my IMM!! oh cupons on books are hard not to give into! 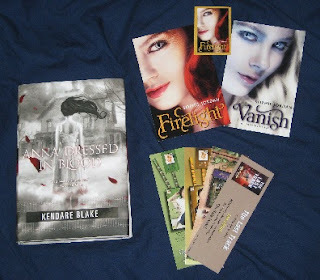 Enjoy your books, especially Anna Dressed in Blood ;) I'm just glad you are that excited about it and it went to a happy home. I'm off to check out Half-Blood, I've seen it around but had not paid attention to it until now. That cover is amazing looking so I'm in cover-love, which means I have to have it.